You can put a pun in a headline on a press release, an article or a blog post. Many people consider puns to be the lowest form of humor, sort of the amoeba of jokes. But people who love words love puns. And reporters and bloggers are word people, so puns could work. It should go without saying that humor should not be used in certain situations, like any kind of bad news such as deaths or natural disasters. There are no good jokes about Mt. St. Helens or the Japanese tsunami. The best way to get a feel for using humor in publicity is to read newspapers, and magazines as well as publicity materials like press releases and articles so you can learn from the masters – and see what actually gets into print. Remember to have several people read your attempt at humor before sending it to a reporter or publishing it. What you think is funny other people might think as lame, juvenile or offensive. But if they laugh, you very well might have a winner. Dan Janal is one of the Founding Fathers of Internet Marketing and Publicity. He believes press releases are an art form – and he can make your message sing and dance to the front page of Google. Learn more by visiting this link. How many of your subscribers open the emails you send? Many coaches and service professionals new to email marketing get discouraged when they look at the measurement called "open rate." Those who’ve been at it for a while do, too. But this number is skewed — perhaps significantly — by what are known as "image blockers." More and more people use web mail providers (such as Gmail or Yahoo) or applications (such as Outlook) that allow users to decide whether to view their emails with the images turned on or off. Likewise, the people that elect to receive text-only emails from you (if you give them the option of text or HTML), also will not register as an "open." Some mobile devices only allow emails to be viewed in text form. 2. Examine your frequency of emailing. Too much emailing can cause "list fatigue" and too little can cause the "who’s that?" syndrome. SPEAK MORE! PROVIDES CUTTING-EDGE, ROAD-TESTED, AND COMMONSENSE MARKETING STRATEGIES TO HELP PROFESSIONAL SPEAKERS ACHIEVE THEIR BUSINESS OBJECTIVES. Thirty-three members (including me!) 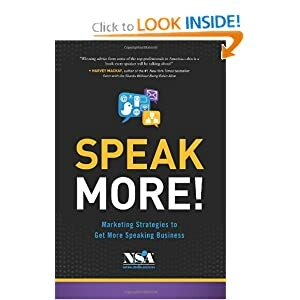 of the National Speakers Association (NSA), including renowned business experts, authors, and marketing gurus, share their sage advice for setting yourself apart from the competition. Whether you peruse the table of contents to find topics that pique your interest or read the book from cover to cover, you’ll discover real-life experiences describing what works and what doesn’t to effectively promote your business, brand, products, and services, and to grow your bottom line. LEARN FROM THE BEST AS YOU READ HOW TO: • Develop a strong personal brand • Get the most out of networking and public relations e orts • Publish a book to propel you from a speaker to an expert • Achieve a professional appearance to enhance your brand • Harness the power of social media • Create a do-it-yourself video • Launch your own radio show • Turn cold calls into hot new prospects • Snag and prepare for media interviews in your field • Optimize mobile marketing with QR codes • Go global with your message • And much more! Speak More! is tailored for keynote speakers, consultants, coaches, trainers, authors, and anyone seeking to expand the reach of their message. Many of the proven methods require little or no monetary investment, yet they provide big payoffs, including increased revenues and opportunities to speak more! After learning from the best and welcoming the rewards from inspired and imperfect action in my own business, I am now debuting the Get Known to Get Paid(tm) PRIVATE Mentoring Program. It is the program I would have gladly invested into to get the support I needed if such a program had existed when I started along my own journey to achieve results in my balance sheet and beyond. Your invitation is to take a look at the program I have created. Here is the link to read all about it. It this program resonates with you, opt in to receive your application and send it to me at nancy@authenticvisibility.com. We’ll schedule a time to chat the first or second week of July to make sure this is the perfect fit for you. And, if so, we’ll journey forward together. There are just nine spots open at this point so take a look and see if this is the program you’ve been searching for. I’d love to be your mentor to show you how to get known to get paid. Here is the link to claim the REPLAY from the “Get Ready, Get Known, Get Paid” free and high value teleseminar. Tad Hargrave of Marketing for Hippies sure knows how to make a point and serve his tribe. Watch his video about the amazing green juice (why you need a niche) to appreciate why gaining clarity around your niche matters. He’s got three upcoming webinars on niching coming up. Choose the one that suits your schedule best, and take his medicine. Your business will be better for it. I promise. Emmy Award Winning Producer and Writer Bill Stainton to Grill Me about Getting Known and Getting Paid – 6-27 at 10 a.m. Join Us! It’s a “Get Ready, Get Known, Get Paid” conversation with no holds barred. Won’t you join us? Here is the link to access the replay. I often say that one good interview leads to another. And when it rains, it pours. (And it does rain a lot here in Seattle…) That is what can happen FOR YOU when you create a signature talk that eases a real pain in the marketplace. One good thing leads to another, and pretty soon, your message can be heard around the globe. That has certainly been my experience since I created the Transform Your Boring Bio from Wallpaper to Wow presentation. It seems I get a new invitation to share it every day. What would happen in your business if you had a talk to share that invites these kinds of opportunities? If you are intoxicated at this prospect, we should talk! Bill Stainton Grills Nancy Juetten: Get Ready. Get Known. Get Paid. June 27 at 10 a.m. Pacific – Claim your place now. This one is going to be juicy! Get Known to Get Paid™ Intimate In-Home Retreat – June 28 – 9 a.m. – 3 p.m.
8 spots are open for perfect guests to benefit. Does one of them have your name on it? — I hope so! Are Your Ideal Clients a Lot Like You? The noise all around can be deafening at times. Being a bit of an introvert, I prefer a quieter approach. It just suits my sensibilities. And having this insight into who I am is really helping me figure out with even more specificity who I am here to serve. What I am getting present to is that my ideal clients are a lot like me. Isn’t that a revelation? So this brings me to an important question for you. What would happen in your business if you figured out with remarkable detail all the characteristics, struggles, and sensibilities of your ideal clients? Are they like you in important ways? And can you use that insight to be even more attractive as a potential solution provider? When I think back to the last 50 clients I worked closely with recently, I note that these are not "scream from the mountain top" or "yell into the telephone" kind of people. They are messengers on a mission for the greater good — and the rewards and results that flow from their inspired service. They are smart, practical resourceful, and committed to earning their success — one step at a time. And once they make the commitment to get help in areas that aren’t their favorite things, they take inspired action. I love my clients. They are the perfect people to benefit from how I serve. I want you to feel the same way about your clients, which is why I invite you to dig deep to consider their characteristics, struggles, and sensibilities. Upon reflection, you just might find "messaging gold" to drive your business forward in ways that give you reason to smile. What you figure this out, be sure to tell me how it pays off for you. I’d love to hear about your results and share them here for all to see! Eight spots are open for the June 28 event. They will go fast, so claim yours — www.getknowngetpaid.com.